Betfair trading strategies can be as simple as scalping where you trade for a small profit. It’s easy to see why newbie Betfair traders try this trading strategy as it’s easy to understand. But there are quite a few Betfair trading strategies that can be equally straightforward, even if you require a bit of speed to jump on. Of course, all trading is made better if you have some Betfair trading software where you can trade in a flash with one click betting. If you don’t have any software, then just download a free trial of the best Betfair trading software available! Let’s see how you can do exactly that. How you can anticipate price movement in a betting market that will ultimately lead to movement on the sports exchanges. 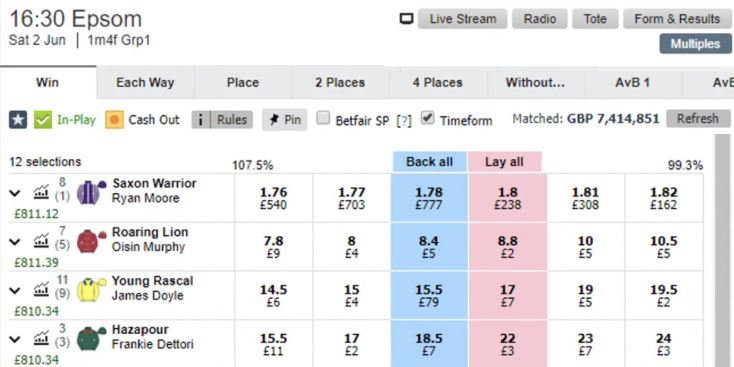 Where possible, I will always use live pictures when Betfair trading, especially on horse racing. When I first started trading on Betfair I didn’t use pictures and came to realise this was a mistake. So when I was travelling, I would go to amazing lengths to get pictures or to talk to somebody who could see them. Why is this? On the left is a picture of the favourite during a horse race, the favourite is going to post, he’s perfectly calm, the jockey has complete control. So upon seeing this picture I initiated a trade. What made me do that? There are so many inputs into what the price really should be when looking at the odds on horse racing, that it’s very often difficult to work out exactly what that price should be. One of the factors that you have to take account of is the horse’s demeanour. Before the racing, you can measure if the horse is going to run well if it has a strong form line. But there are many moments when you judge if the horse is going to behave itself and put in a good run. It could be when they go to saddle up the horse and it doesn’t like it, or it’s perhaps getting a bit tetchy or recalcitrant as they say in racing circles. Then you get the horse going to post or loading into stalls where you can judge it’s character on the day. Therefore if you were going to put your money down on a horse that exhibited that type of behaviour you wouldn’t if you were a professional punter. A professional punter will be looking at all of those characteristics. This is in stark contrast to football trading or football betting, where you are not too bothered about the demeanour of the players just before the start of the football match! You are really unlikely to lay the draw just based on what the players are doing before the start of a football match, that’s not going to affect the correct score market. In this image, you will see the favourite is in front. Can you notice the difference between the two of them? If you look at the favourite (in front), you can see that its coat is very reflective and shiny – look at the horse behind and its coat is very matt and non-reflective. The favourite is ‘sweating up’. It is not considered normal when a horse starts to sweat up and it’s usually because it’s anxious. When you’re looking at much shorter races you want the horse to have all of its energy ready to run that particular race, you don’t really want it using an expending energy on the way to the start of the race itself. So although it seems like a funny thing to be looking at, it can give you a clue in the market as to what is happening or what is going to happen next within the market. The favourite is unlikely to be backed any longer and you may actually find people come in actively lay the horse when it exhibits this sort of characteristic. 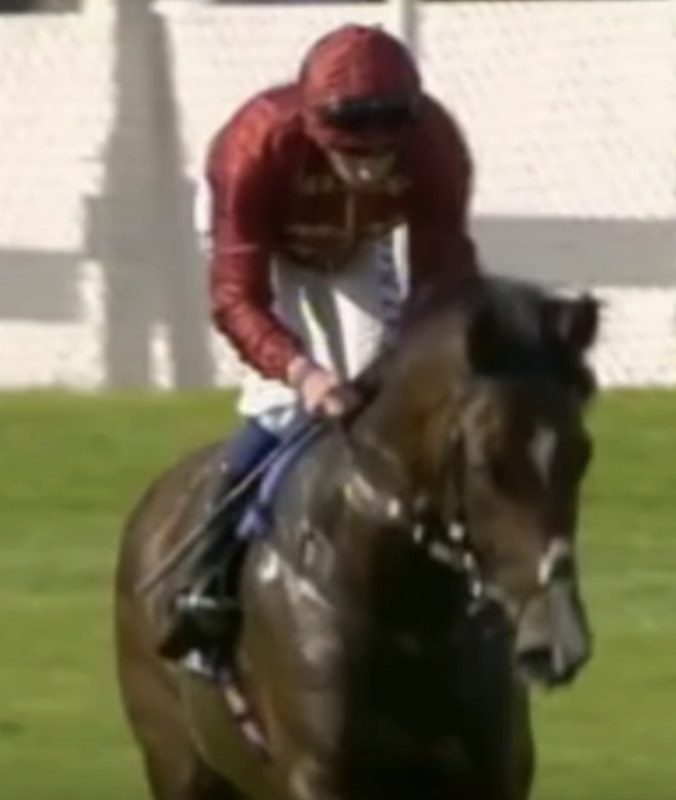 When I see something like that then I’ll lay the horse within my sports trading software with the expectation that the backing will dry up and the price may start heading out in the other direction. 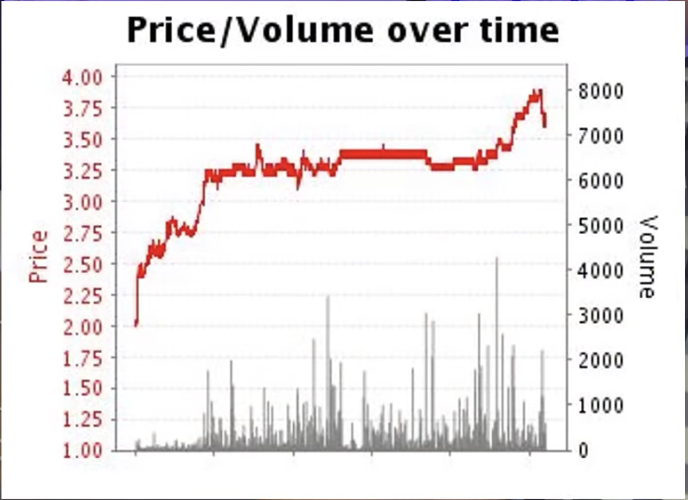 If we look at the graph from the betting exchange on that particular race you can see immediately that when pictures became available everybody started laying it (or not backing it) in the market and sharpest were probably using sports trading software. The Derby market was pretty interesting this year. 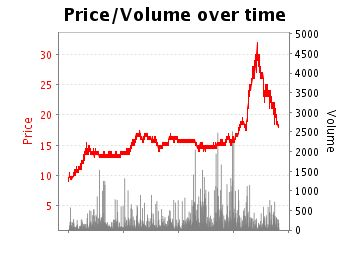 Here was a very big market, the biggest sports trading market on Betfair that I’ve seen for about ten years on the Derby. Most of that was due to the interest in the favourite and the fact that it was that a shorter price. That tends to generate volume anyway. 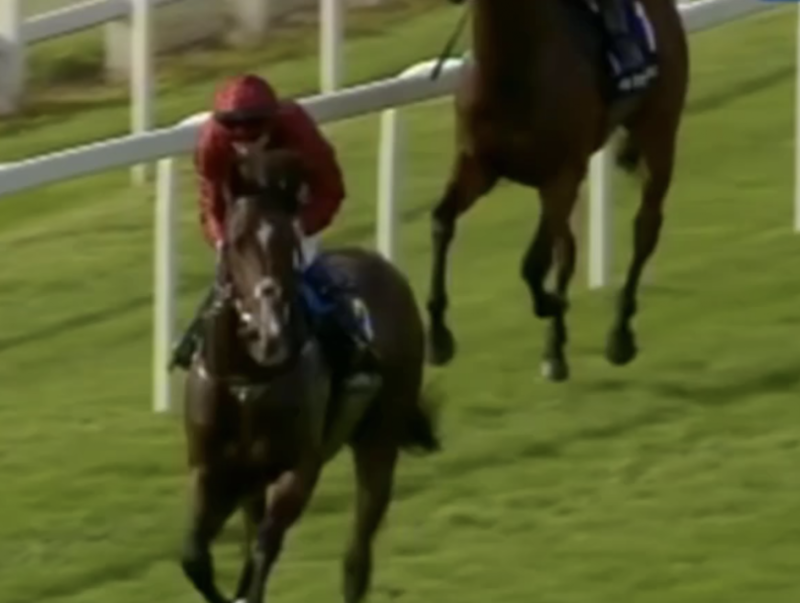 The opportunity I’d like to highlight to you in this horse racing market was on Hazapour. Everything was going normally on Hazapour and then all of a sudden boom the price goes flying out” Now if you would have looked at Hazapour on the way to post here you would have noticed absolutely nothing. Of course, upon seeing the price on the betting exchange start to go rocketing out, I immediately turn my attention to the pictures again to have a look and see if I could find where Hazapour was. He was absolutely fine! There were no issues, no reason to think that the price would go out. So on the face of it, it looks like a total anomaly. When you see this in the horse racing market, what you should do is, as the price starts flying out – try and catch it, right at the top. Put a couple of orders into the betting exchange at a speculative price near the top and when you see the price starting to head back in the other direction then you can trade out a much lower price. We effectively traded the fact that the odds had shot out on Hazapour but there was little or no basis on why. If it was really playing up or sweating up then maybe it would be justified. As it was, it just looked like a load of panic in the market. We sold panic and bought ourselves a nice profit. In this case £810 fully hedged across the entire Derby field. We could have left the profit unhedged on Hazapour for a massive free bet. But of course, that would only come in if Hazapour won. So it was better to hedge that and ensure a healthy profit on the race. Within Bet Angel, if you use the automation features, including advanced automation or a servant, you can actually get Bet Angel to monitor how much a price is moving and if it moves quite violently within a short period of time Bet Angel can actually alert you to the fact that that has happened. It can do that by popping up a message on your screen or you can actually get it to fire off a sound alert. I use the sound alert, it’s telling me things that are happening within the market that I’m not necessarily looking at. If you’re in the market and something that you were trying to back is it at a low price it’s 15 – 17 and then you see it available at 30, what are you going to do? You’re going to back it, at the best available price you can. Arber’s kick in, bookmakers, people hedging it, gamblers seeking value perhaps. Generally speaking, people who can see the anomaly start place back bets and that brings the price all the way back down to where it was, from its extreme heights. This particular opportunity occurred in the Derby, completely unexpected, totally out of the blue and it does happen quite frequently. When the price spikes out unexpected like that and you can see no cause and that’s probably an opportunity to do a back to lay trade within that market. Horses are animals not machines, this is the wonder of horse racing. You never know precisely what horse will turn up on the day of the race. Horses that are fretful or displaying signs of being nervous tend not to be liked by the market and therefore will not be backed and make for good laying opportunities to initiate a trade. Prices that drift significantly but without the horse displaying any unusual behaviour can make for very good opportunities to initiate a trade with a back bet, as you expect the price to shorten to more normal odds.